23andMe Reviews: Will You Discover Shocking Ancestry Results? Home > Health > DNA > 23andMe Reviews: Will You Discover Shocking Health & Ancestry Results? Wondering if you’ll be diagnosed with a disease later in life? Could the condition skip you but be passed on to your children? You can learn about your health and ancestry all with a spit of your saliva. Okay, maybe it takes a little more than one spit, but it’s a super simple sample that you can send in and have results within weeks. 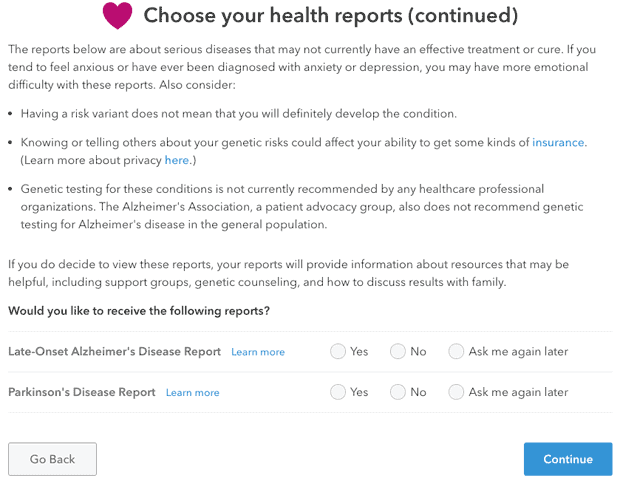 What Reports Are Included For 23andMe? 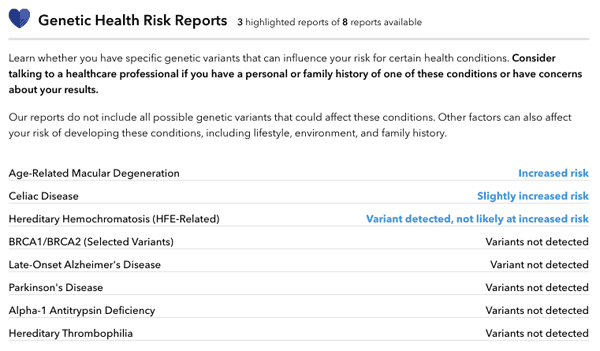 Below are the FDA-approved genetic health risk reports included for this 23andMe health review. 23andMe occasionally has time-sensitive coupons including a Holiday Offer: Save 30% on each kit through December 25th, 2018. Click here to take advantage of these limited time deals. What Comes In A 23andMe Kit? Take a look at what’s included in a 23andMe Ancestry + Health DNA kit in the unboxing video below. Below are some critical differences between 23andMe and its competitors. African Ancestry focuses solely on Africa, whereas 23andMe is worldwide. African Ancestry has more limited results than 23andMe does. 23andMe can test for health and ancestry, African Ancestry only tests ancestry. Ancestry.com’s DNA database has 10 million people compared to 23andMe, which has 5 million people. 23andMe’s genealogical community forums are lacking compared to AncestryDNA’s. Easier to connect with genetic matches on AncestryDNA versus 23andMe. 23andMe’s database has 5 million people compared to Family Tree DNA’s, which is just over 1 million people. Family Tree DNA doesn’t offer any health-related DNA testing. Family Tree DNA offers Autosomal DNA and in-depth Y-DNA and mtDNA testing kits. This is the only site to offer this. 23andMe only offers Autosomal DNA testing. Vitagene does not test for genetic predisposition, 23andMe does. Vitagene costs $99 for the health and ancestry report. 23andMe is more expensive at $199 for the ancestry and health report. Vitagene only has participation in the U.S., while 23andMe is available worldwide. What Do People Think Of 23andMe? Exploring Life’s Mysteries purchased a 23andMe Ancestry and Health DNA testing kit for me to try and review. After submitting my results the first time, they came back “insufficient to produce genotyping results.” 23andMe said this is uncommon, but does occur occasionally, so the company sent me a replacement kit. I was worried I’d have to wait another 4+ weeks for my results, but the results came quickly. There are 5 categories with results from my 23andMe DNA test: Health Reports, Carrier Status, Genetic Health Risk, Traits and Wellness. I’ll briefly discuss the main takeaways from each report to give you an idea of what you could expect if you submitted a sample to 23andMe. My ancestry report was pretty uneventful, but I don’t mean that in a bad way. My maternal grandfather has a book dating back multiple generations that includes family tree information and our ancestry composition. I remember as a young girl doing a class project on my family’s heritage and that book was extremely helpful. 23andMe’s results for my ancestry report confirmed everything I already knew, which gives me peace of mind knowing that the results and the book were similar. I shared the results with my husband and we were ecstatic. Although I could still fall ill with one of these diseases, it’s comforting knowing the variants tested were undetected. My husband stated that he could never read results like this because he would take negative results as a death sentence. I don’t blame him one bit. I’m very fortunate with the results I received and understand why someone may opt out of reading the health risk results. Personally, I’ve always been a curious person and like to know as much as possible about something ahead of time to help prepare me. Although reading results that I had increased risk for certain cancers, Alzheimer’s and/or Parkinson’s would’ve been terrible to learn, I would also be happy to know that I could come to terms with the possibility of me obtaining those diseases sooner than later. I realize it’s easy for me to say that is how I would react, but I truly believe that. My mother was diagnosed with ALS (Amyotrophic Lateral Sclerosis), also known as Lou Gehrig’s Disease, in 2016 and died in 2017. I spent the weeks and months following her diagnosis researching and learning everything I could about the disease and how she could live longer. In the end, the information was helpful, but I wish I would’ve spent that time calling her on the phone and spending more time with her instead of stewing over her fatal illness. 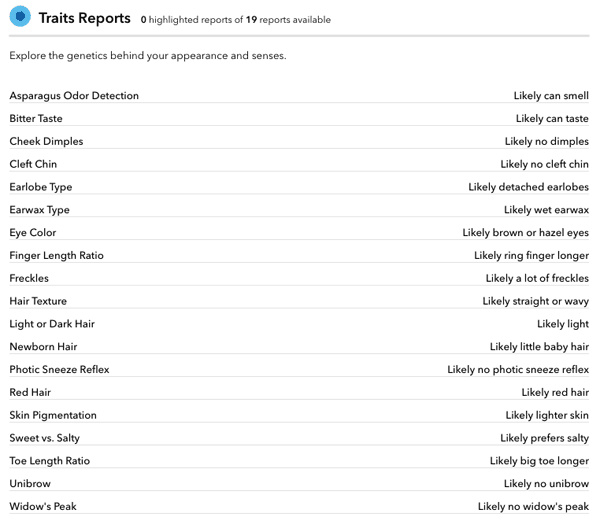 Some of the traits 23andMe tested for crack me up, asparagus odor detection (in urine), earwax type, toe length ratio, etc. I have 0 out of 19 highlighted reports for my traits results. This was a less interesting for me because I had taken some surveys through 23andMe and I recall some of the questions being asked. Although (nearly) all of the results are correct, I wonder if my results are genuine here or if they were just taken from the surveys I answered. However, some of the results I remember not being asked about and they are still correct, so it’s still cool to know that my DNA results show that my ring fingers are are longer than my index fingers and my big toe is longer than my other toes. The one result that was off on this one (sort of) was that it said I was likely to prefer salty snacks opposed to sweet snacks. Typical me prefers a chocolate candy bar or yummy pastry. However, at the time I took this test I was pregnant and I have been leaning towards the salty and savory snacks lately. So I won’t be too hard on 23andMe for this one. Overall, these results weren’t much of a shocker to me since I know I don’t have dimples, my eye color is hazel, I have red hair, many freckles and light skin. I know my physical traits, but it was still fascinating to know these items can be detected in my DNA. My wellness results highlighted 3 out of 8 reports. I wasn’t totally bummed at these results except that my muscle composition is uncommon in elite power athletes. 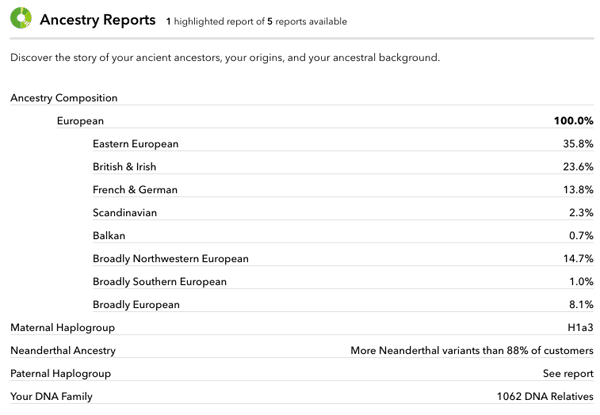 However, perhaps 23andMe meant that I’m superior than elite power athletes and have astonishing muscle composition, but I won’t hold my breath on that one! This process was super simple. All I had to do was use the code on the side of the test tube and create an account on 23andMe’s website. The website also lets me know which step my kit is in throughout the testing process. After I filled the tube with my saliva, I added the solution cap and shook it for about 5 seconds, per the directions. 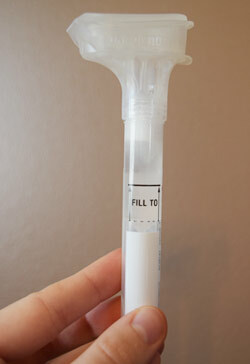 I then removed the solution cap and added the regular cap to prepare the sample for shipment. The kit came with a prepaid return box, which had directions on it as well. I loved that the box was small and could be dropped off in a USPS collection box or placed in a mailbox. (Not waiting in long lines at USPS is always a plus in my book!) It was straightforward to place the test tube in the sealed bag and in the return box and send it off for testing. The box included a tracking number on it which is handy to see when the lab will receive my results. First of all, I really like that I received ancestry and health results with one single test. I think it’s really cool that I can receive reports about diseases that I could potentially be diagnosed with later in life. However, this isn’t the test for everyone. 23andMe warns users about the anxiety or depression you may feel if you receive health results that are less than ideal. I think this is important because it shows 23andMe cares about its customers and doesn’t want the test results to cause stress. Personally, I’m a very curious individual and like to know as much as possible, so I opted to receive the reports. Am I Happy With My Results? Overall, I’m pleased with my experience with 23andMe. It’s fun to learn more about my ancestry and health and I can share the information with other family members. If you’re someone who has low anxiety and doesn’t stress out too easily, then I’d recommend this test to you. However, if finding out you have characteristics in your DNA that are associated with fatal illnesses will weigh on you, I recommend choosing an ancestry specific DNA test and not one that includes health results. We reached out to our networking asking for any success stories from using DNA tests and Charlie Basham shared his personal experience of using 23andMe to discover his paternal roots. Read about it below. I was adopted at birth 67 years ago and throughout my life I’ve lived with a sense of loss and abandonment. I really didn’t know who I was. Did I come from a clan of heroes or horse thieves? I had to find out some day. If anything, to pass the info on to my daughters. In my 20’s I began a 40 year frustrating and disappointing search for my birth parents. This was well before the DNA search process was available. I hit dead ends every step of the way. Finally I tapped into an amazing underground network of “professional” adoption searchers on the Internet. Within days (and after a $400 cash bribe to a government worker) I found my birth mother– unfortunately it was 30 days after she’d passed away. She took to her grave all hope of finding my birth father! But I excitedly dug into my birth mother’s ancestors. I found mostly farmers, carpenters and merchants. But I also discovered a 3X great grandfather who had a well-documented Civil War experience tied directly to President Lincoln and John Wilkes Booth. Simply put, my kin’s Union Army war actions in North Carolina indirectly helped prevent Lincoln’s kidnapping by Booth in Washington D.C. But it may have also indirectly led to Lincoln’s assignation a few weeks later! Granted, it took some digging on his part, but through the magic of DNA testing he was able to uncover some deep mysteries and have peace mind knowing who some of his relatives are. Find out how 23andMe stacks up against Family Tree DNA, Ancestry DNA and other 23andMe competitors in our Best DNA Test article. Are there companies better than 23andMe? Find out in this comparison. 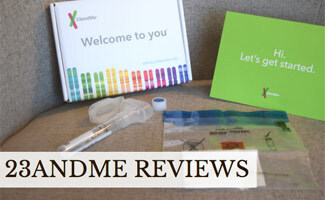 Share your 23andMe genetic testing reviews with us!